Your prayers and gift will ensure that the Maryknoll Fathers and Brothers continue to prepare young men for religious life as they embark on missions to help those less fortunate in more than 20 countries. About Father Daniel Kim, M.M. Father Daniel was seeking concrete direction for his life and so in 2005 went on a pilgrimage to Europe. There, he witnessed the murder of Brother Roger Schutz who founded the Taizé ecumenical monastic community. That moment brought him to explore his vocation in a deeper way. He stayed in Europe for another semester to study Scripture and soon after he met Maryknoll Father Alfonso Kim, who introduced him to the Maryknoll Society. 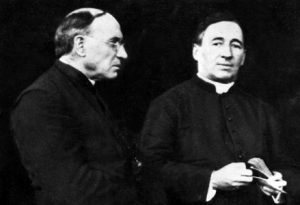 About Father Peter Latouf, M.M. Father Peter started out just filling a college language requirement for his bachelor’s degree in psychology and international studies when he chose Mandarin Chinese. After three semesters of Mandarin, he spent a summer in China on a school trip. When he left he knew he wanted to go back. Having been raised in a “very strong Catholic” family, he started asking priests in Detroit how he might do mission work in China and they directed him to Maryknoll. 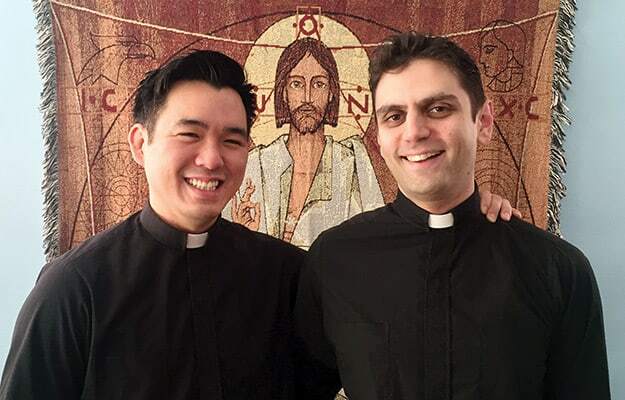 Fathers Kim (L) and Latouf (R) were ordained as Maryknoll priests on May 20. ~ Father Peter Latouf, M.M. With your prayers and support, you are participating in a legacy of faith that is more than 100 years old! Read more about other ordained Maryknoll priests. of faith was fanned to flame. with light to overcome the dark. proclaiming Good News to the poor. JOIN US and your gift will make sure that Maryknoll continues to prepare young men for religious life for years to come.